Last Friday in the lunch room of the Twins academy in Ft. Myers, players were eating after their morning workout and before their afternoon games against the Rays. Standing in the middle of the room were a couple of guys speaking to each other in German. 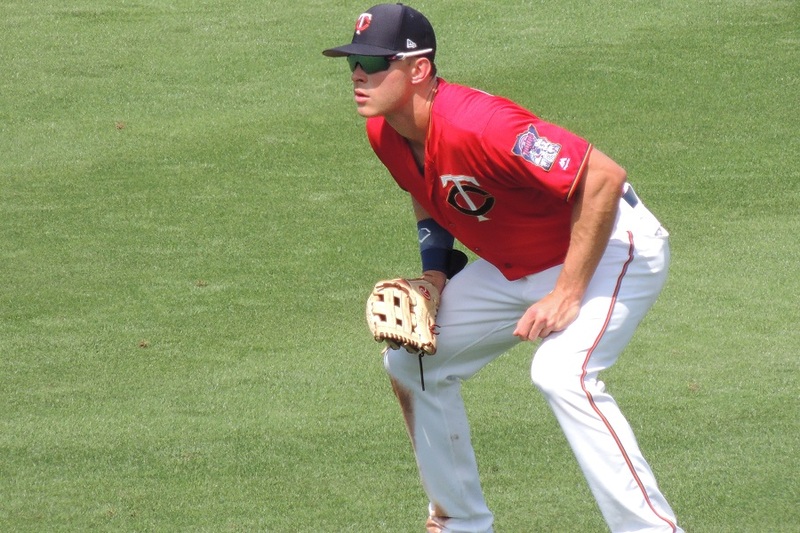 Niklas Rimmel, a right-handed pitcher from Berlin that the Twins signed following the 2017 season, was meeting his role model, fellow Berlin native and Twins outfielder Max Kepler. It was the first time that the two had met and the conversation lasted just ten to 15 minutes, but they will talk again before the Twins leave Ft. Myers to start their 2019 season. Rimmel is the most recent player that the Twins have signed from Germany. When the Twins signed Kepler out of Berlin in 2009, he received a $700,000 bonus, at the time the largest ever signed by a German-born player. Raw at the time, Kepler grew and continued to develop. He was the Twins (and Twins Daily’s) Minor League Player of the Year in 2015. He helped the Chattanooga Lookouts to a Southern League championship and the next day made his Major League debut. He wasn’t on the Twins Opening Day roster in 2016, but he was called up soon after and has been up ever since. In 2018, he was the Twins choice for the Jim Kaat Award, handed out at the Diamond Awards to the top defensive player on the team. He also hit 20 home runs in 2018. Early in spring training, Kepler and his first baseball roommate, Jorge Polanco, were signed to long-term contracts. Kepler, who was arbitration-eligible for the first time this offseason, signed a five year, $35 million contract with a couple of option years. While the Twins and their fans look for him to really take a step forward in his production on the diamond starting in 2019, Kepler has already risen up the charts in terms of the top players born in Germany to play in the big leagues. Today, we will show where Kepler ranks among German-born players, what his signing has meant for baseball in Germany, and how Kepler is viewed by young baseball players in his home country. 11-year big leaguer Mike Blowers who was born in Wurzburg. His step-father was in the army. 11-year big leaguer Jeff Baker who was born in Bad Kissinger. His father was Lieutenant Colonel in the US Army. 10-year big leaguer Bill Kuehne whose family immigrated to the United States when he was very young, played in the 1880s. Other MLB players born in Germany in military families include: Ron Gardenhire, Craig Lefferts, Edwin Jackson, Will Ohman, Bruce Maxwell, and Phillies outfielder Aaron Altherr. With his recently-signed five-year contract extension, it is likely that Kepler will distance himself from the pack and be the best player ever born in Germany. Of note, he wasn’t just born in Germany, but he lived there his full life and was signed in Germany. The others moved to the States, be it for military transfers or family immigration in the 1800s and early 1900s. Niklas Rimmel is a big, tall, right-hander pitcher from Berlin who the Twins signed after the 2017 season. He made his professional debut in 2018 with 14 innings pitched in the Gulf Coast League. He is likely to begin his 2019 season there as well. Rimmel began speaking with scouts when he was 15 and playing in international tournaments in Europe. “Basically the only way you can be scouted or seen is at a European, international tournament,” he said. He had several options for teams interested in signing him. While baseball remains a secondary sport in Germany, behind the likes of soccer, among baseball people in Europe, Max Kepler is very highly regarded. With the help of the MLB's academies in Europe, players there do have some more opportunities to be signed than in the past. There are academies in Germany, Italy and The Netherlands. New ones pop up from time to time. As Rimmel noted, that is the main means of players being noticed by MLB scouts. While Kepler is a hero to kids who love and play baseball in Germany, soccer still easily remains the sport of choice. Max Kepler came out of the academy in Regensburg, Germany. He told me that there is now one in Paderborn as well. There was always value for the Twins, or potentially other organizations to sign the best players from countries where baseball was not as popular. The Twins have signed Vadim and Petr Balan from Moldova. Matej Hejma and Jakub Hatjmar signed from the Czech Republic. Hein Robb was from South Africa. Tom Stuifbergen signed from The Netherlands. Frederic Hanvi signed from France. Nik and Andrei Lobanov signed out of Russia. None of these players got to the big leagues. But the Twins name is known in each of those countries. The same can be said in Australia where the Twins have always been a top contender for the top talent. But even with the rise of Max Kepler to the big leagues, that alone can’t alter the thinking of a whole country. But again, in baseball circles, Kepler and the Twins are very popular. He has done it before in Berlin. He talked to some of his coaches and some of his former teammates. They sold out the camp with 100 kids. For those kids, and every kid who plays baseball in Germany, Max Kepler is the face of not only the Twins franchise, but of Major League Baseball right now. Very cool to learn about this. It is always interesting to see the path these pilgrims have taken to get to the big leagues. You did hit the key to this story, Seth.Of all the players listed, he is the only true German.By that I mean he is a native German who grew up playing baseball in Germany.The others are all some combination of U.S. Military kids who were born in Germany, but probably grew up playing ball in the U.S.And a few were born there, but moved to the U.S. and played their youth ball here.So Max is really one of a kind. And I believe he is going to have one heck of a year. "11-year big leaguer Jeff Baker who was born in Bad Kissinger." According to Google, it's 4.5 hours from F*cking, Austria. I think that one might be surprised to know that since 1984 Germany has had a professional baseball league in two levels with about 30-35 professional teams or so. The problems in developing talent, like with most cold weather countries, are:1. it is not a school sport, but a club sport (think Rugby in the US) and 2. the season ends in July because of the weather.So there is not a lot of time to practice and kids do not start young, which puts Germany (and other similar countries) in disadvantage as far as talent development goes. There are many very good baseball coaches from the US working in Germany in the little leagues.The military has set this up for the kids very nicely.Most of us assume the competition is worse in over there, but I would not be surprised if the median little leaguer there is better than the median little leaguer here. Sure, the top team in the US could probably beat the top team in Germany more often than not, but for every very good little league team in the US there are a hundred teams that aren't good at all. across the river from good kissinger. So proud! I'm a Twins Fan since 2003 and with Kepler-Max im i can chear for a fellow German! And it's Bad Kissingen, Bad in front of City Names means you can go there for treatment, health and diet!